In the beginning was Theatre Notebook, started in 1945 as a slim four-page journal by three friends, Sybil Rosenfeld, Ifan Kyrle Fletcher, and Richard Southern, none of whom was an academic. There were no drama departments in those days (Bristol was the first British one, started in 1947) though there were a few scholars in English departments who were interested in theatre as opposed to drama as literature, notably Allardyce Nicoll (Birmingham), who later became the Society’s President. The Society itself was founded on Tuesday 15 June 1948, at a public meeting held in the war-damaged Old Vic, with no stall seats and just a few working lights. 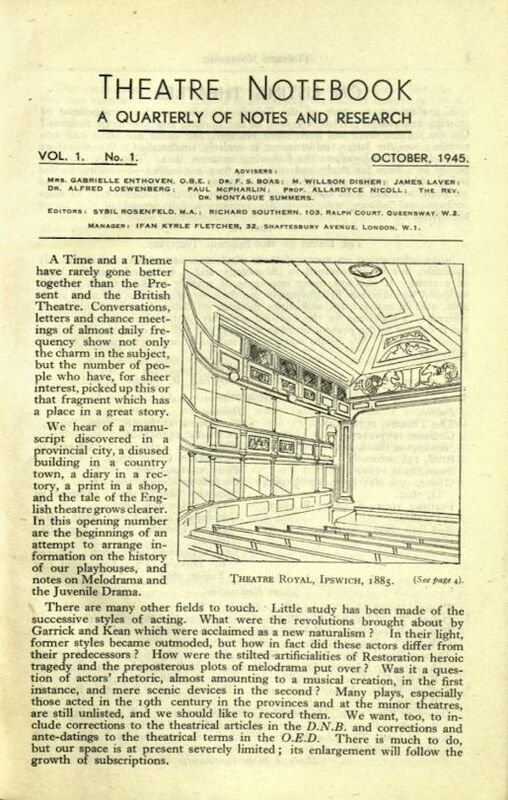 People entered by way of the Stage Door and foregathered in this cavernous shadowy space, summoned by leaflets and by a letter in the Times Literary Supplement (29.5.48) from Sybil Rosenfeld, saying that the need for a Society for Theatre Research ‘has long been felt and with our present dramatic revival is becoming increasingly apparent’. 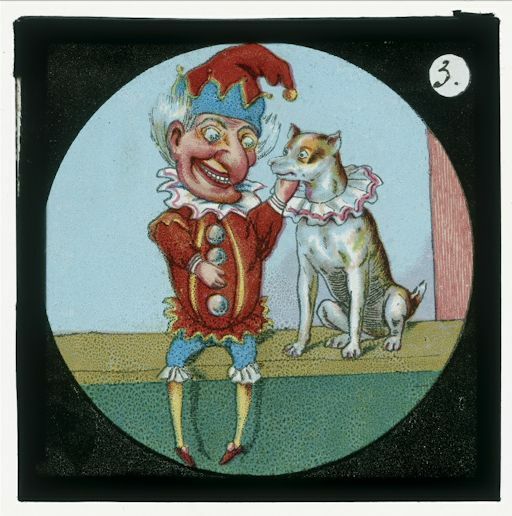 The speakers were James Laver, Keeper of Prints and Engravings at the Victoria and Albert Museum, who gave an account of theatre collections in this country and advocated ‘an enormous place where everything connected with the theatre could be accessible to everyone interested’; Michael Macowan of the London Mask Theatre, who felt that the time was right for such a Society because people working in the theatre were beginning to perceive patterns of development in their art and wished to preserve records of what had been done rather than let it be forgotten; and Ifan Kyrle Fletcher of Theatre Notebook, whose demands were that members should bring together their enthusiasms in a true community of interests, maintain a staunch loyalty to scholarship and always use it in the best interests of the living theatre. He proposed that a Society for Theatre Research be founded. And lo, it came about that the first general meeting of the STR took place two weeks later on June 29th 1948. The first ten years of the Society’s existence were very busy ones. Besides a programme of public lectures and the annual publications, there were events in celebration of the centenary of William Poel in1952 (leading to the establishment of the Poel Memorial prize, forerunner of the Poel Workshops), an International Conference on Theatre Research in Summer 1955 (leading to the setting up of the International Federation and the first World Conference on Theatre Research in Vienna in 1957), a public meeting on the setting up of a Theatre Museum in late 1955, and in conjunction with the Council for the Protection of Theatres (forerunner of the Theatres Trust) work for the preservation of theatres threatened with demolition (St James’s lost, Her Majesty’s saved). During this period there were regional groups in Manchester, Bristol, Birmingham, but by 1957 only the North West Group was still active. The arranging of exhibitions was encouraged and several were put on at the Finsbury Library, including one on North London theatres. The tenth anniversary was celebrated at Crosby Hall in June 1958, with a buffet supper for members and an entertainment arranged by V C Clinton-Baddeley. With Professor Allardyce Nicoll as President and Dame Edith Evans as Vice-President, this was largely a period of consolidation – the Poel Prize continued at RADA and the Central School but moves were afoot to widen its scope; the International Federation flourished with meetings in Munich, Vienna, Paris, Amsterdam, London and Berlin; the Theatre Museum Association took a room in Leighton House as an exhibition centre. 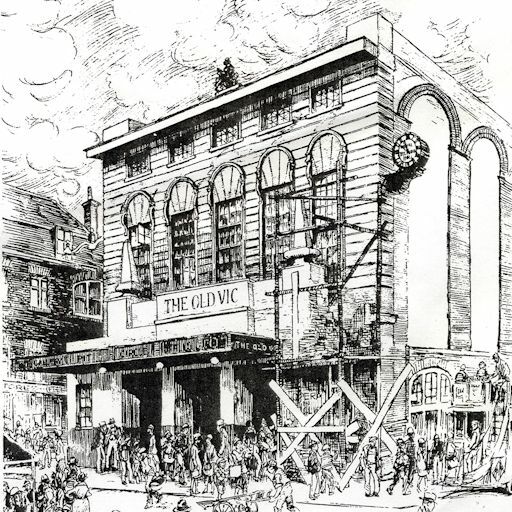 There was much activity in connection with proposals to demolish various theatres – the Aldwych, Golders Green Hippodrome, the Adelphi site, Plymouth Theatre Royal – and the Theatres Council became the Council for Theatre Preservation and then the Theatres Advisory Council. Initiatives included the celebration of the tercentenary of Punch’s first appearance in London with a (still evident) plaque placed on a pillar in St Paul’s Church Covent Garden; the marking of the Shakespeare quatercentenary with an exhibition at the Guildhall, publication of Arthur Sprague’s Doubling of Parts in Shakespeare (still in print) and the planting on 23rd April 1964 of a Shakespeare Oak on Primrose Hill by Dame Edith. 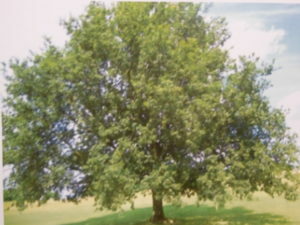 The commemorative plaque was subsequently stolen but the tree flourishes still. Otherwise much of the decade was taken up with efforts to get a new edition of Lowe’s Bibliography into print; first expected to appear in 1962, it was the end of the decade before it finally went to the printer. The Society’s under-visited Library, together with that of the Theatre Museum Association, was transferred to the University of London Library with the proviso that they would both be given to the proposed Theatre Museum when established. Lectures moved from the College of Preceptors to the Art Workers Guild. This was the period which in 1968 saw the abolition of stage censorship. 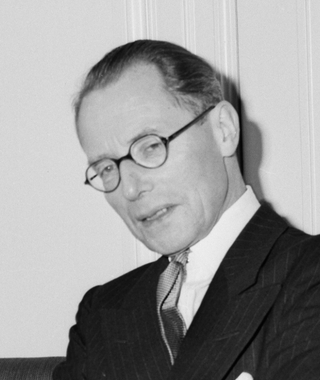 The Society can claim some credit for what has become popularly known as the ‘Reading Amendment’ to the Theatres Bill, so called after Jack Reading of the STR who led the campaign for the manuscripts of all new plays produced to be deposited with the British Museum, so ensuring the continuation of the Lord Chamberlain’s collection. In 1969 the IFTR ventured out of Europe for the first time, meeting in New York with considerable financial support from the American Society. The Edward Gordon Craig Memorial Lecture, set up by the British delegation and usually given at the Venice Institute, in 1976 was delivered by Edward Craig at Smallhythe to an audience of STR members. The Society’s 21st birthday in 1969 was celebrated with the cutting of a cake by Janet Suzman. 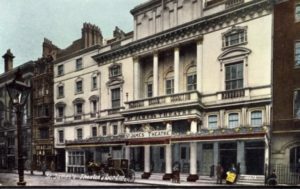 The Theatre Museum finally came into official existence but without a home; Covent Garden was the preferred location, with a projected opening date of 1980. The new Lowe edition, re-titled English Theatrical Literature 1559-1900, finally appeared in October 1970, the cost being more than £6,000 (approaching £90,000 today!) 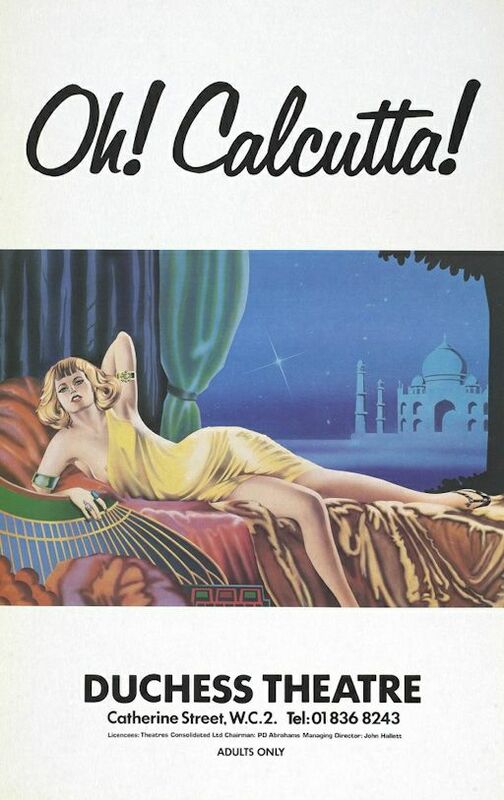 It didn’t make the Society’s fortune, as had once been hoped, but it did win the Besterman Medal of the Library Association for the most outstanding bibliography of 1970. There are still a few copies in stock. The Society gave evidence at enquiries into ‘redevelopment’ projects, including the Lyric Hammersmith (rebuilt, but with the decoration of the proscenium arch preserved), the Grand Theatre Blackpool, the ever threatened Theatre Royal Portsmouth, and the Theatre Royal Bristol, which lost its understage machinery. Meanwhile, the Society continued to provide an information service and to find answers to a great many theatrical queries. The decade saw the STR’s programme of lectures and publications continue, with the addition of a weekend meeting in Chester in 1984 and design study days in 1986 and 1987. It was also a period which included some notable celebrations, and which ended with a significant change in the Society’s fortunes (literally). 1979 saw the 200th anniversary of Garrick’s death commemorated with a service in Westminster Abbey; in 1980 the 75th of that of Henry Irving with the laying of a wreath at his statue; and in 1983 the 150th of that of Edmund Kean with the laying of a wreath in Richmond Parish Church. 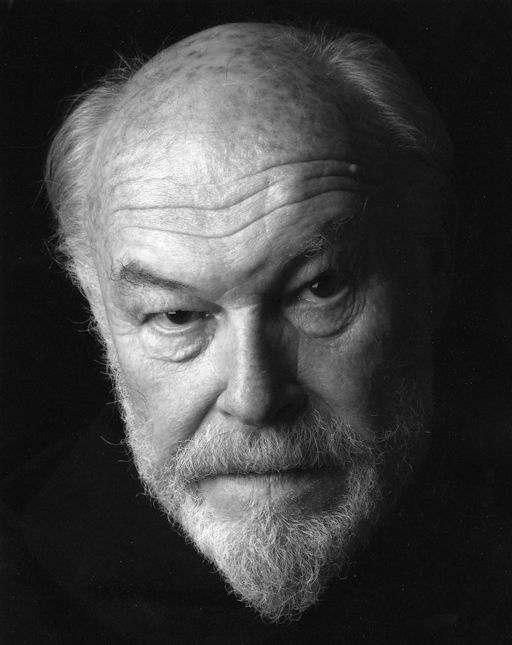 In May 1983 the Poel Prize, now reinvented as the uncompetitive Poel Festival, began its first sojourn at the National Theatre, with all members of the Conference of Drama Schools invited and favouring duologues rather than monologues. Evidence continued to be given to enquiries on several theatres’ futures – Northampton Theatre Royal, Craig-y-Nos, Normansfield and Wilton’s Music Hall amongst them. It was proposed that the roundabout to the south of Westminster Bridge be renamed ‘Astley’s Circus’; the GLC was not co-operative. Work finally started on the Theatre Museum in January 1984 and it opened on 23rd April 1987. The Society’s long-term financial outlook improved: the President’s Fund was set up by Professor Glynne Wickham to build up capital investment, and a bequest was received from the Stephen Joseph estate. In 1987 a Research Sub-Committee was convened; with about £1100 available from the Stephen Joseph money a small beginning was made, and a number of Research Awards were advertised. 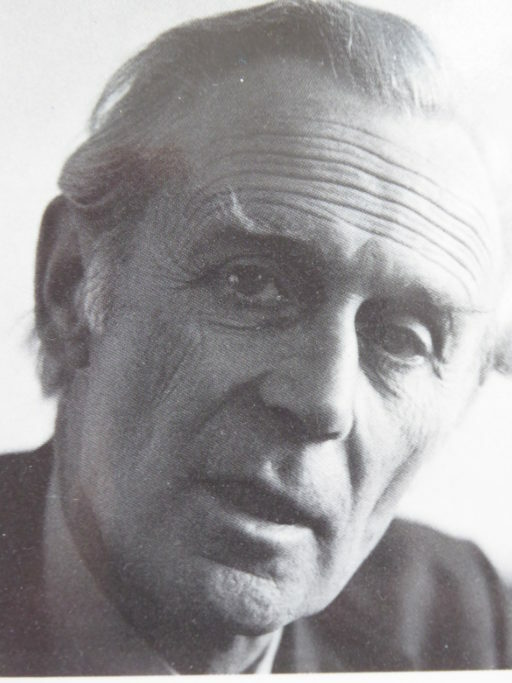 Then in September 1987 the Society was informed that a member, Anthony Denning, had died and left the Society one-fifth of his estate, worth some £90,000 (nearly £250,000 today), and the Society’s fortunes underwent a considerable change. The Denning bequest enabled a number of initiatives – honoraria for lecturers, the purchase of an Amstrad computer for the Treasurer, the publication of Mr Denning’s book Theatre in the Cotswolds – but most importantly the augmentation of the Research Awards Fund. A total of £1100 was awarded in 1988 thanks to the Stephen Joseph bequest but with income from the Denning money and a further legacy of £50,000 from Kathleen Barker this increased to £4-5000 in subsequent years. These very generous benefactors are remembered in the awards which bear their names. Outings included a visit to the Margate Theatre; a plaque to commemorate Ann Oldfield at 60 Grosvenor Street, unveiled with an address by Barbara Jefford in March 1992; a weekend in Richmond, Yorks, in 1993, with a theatre performance; and a commemoration of the centenary of the assassination of William Terriss at the Adelphi Theatre in 1997. 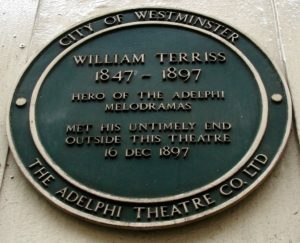 The Society had published George Rowell’s William Terriss and Richard Prince: Two Characters in an Adelphi Melodrama in 1987. It was during this decade that the Committee meetings moved to the Theatre Museum, where the Study Room and the Library were now open – the Museum largely took over the Society’s role in answering enquiries; the custom of having a lecture performance in December was begun in 1993 by George Speaight speaking on Tim Bobbin; there was a record attendance for a lecture by Christopher Fry, later published as a pamphlet; two further Study Days were held; and the Society’s first website was launched. There were fewer threats of demolition of theatres, but the Society’s views were sought on the restructuring of the Royal Opera House, on the Lyceum, the Rose Theatre, the Dominion Theatre (reprieved), the Tower Circus Blackpool, Sadler’s Wells, and the rebuilding of the Stephen Joseph Theatre in Scarborough. As well as a good deal of planning by the Society for the 1998 IFTR conference, to be held in Canterbury with a day in London, much thought was given to marking the Society’s 50th anniversary year. 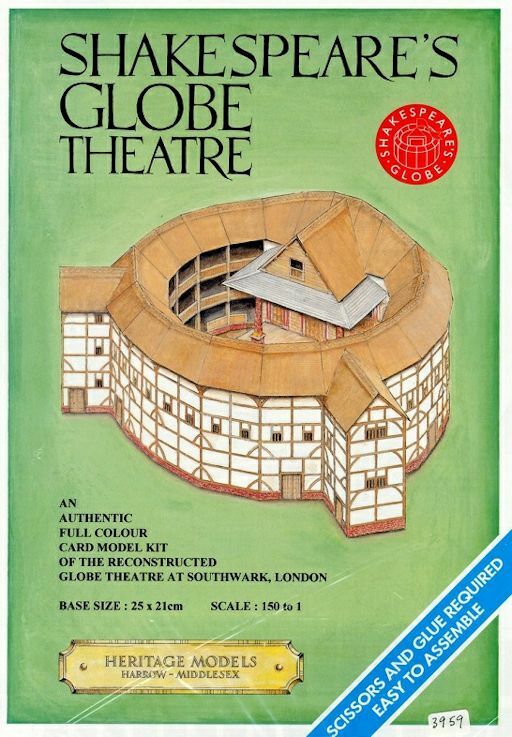 It was decided to award an annual Theatre Book Prize for the best work of theatre research on ‘British or co-adjunct theatre’ published in any given year, the first to be given in 1998. The Golden Jubilee celebrations continued in 1998 with a party at Shakespeare’s Globe, the publication of Philip Butterworth’s Theatre of Fire in an appropriately coloured dust jacket, and the awarding of the first Theatre Book Prize to Colin Chambers for Peggy: the Life of Margaret Ramsey, Play Agent. To complete a very busy year, the STR organised a day in London for 150 delegates to the 1998 IFTR conference held at Canterbury – tours of The Globe and The Rose site, visits to the British Library and the Theatre Museum, and a wine reception in the latter’s Portrait Gallery. The IFTR itself continued to become increasingly international with conferences outside Europe in Africa, America, Asia and Australia. The STR’s own initiatives included the establishment of an annual Glynne Wickham lecture; the December lecture was renamed ‘The Maggie Collins Christmas Lecture’ in recognition of Miss Collins’s bequest to the Society of the residue of her estate, worth just over £250,000 (100 members attended Horatio Blood’s Christmas 2006 toy theatre performance); and responsibility for the annual Craig Memorial Lecture was taken on by the Central School of Speech and Drama with financial support from the Society. A Study Day on British Asian Theatre was held in October 2006 with Jatinder Verma as keynote speaker. The Northern Group ran a full and lively programme throughout the decade. Outings included visits to the restored Gaiety Theatre on the Isle of Man in 2000; to the refurbished Covent Garden in 2002; to the Tivoli Pantomime Theatre at Laban in 2003 for the 21st anniversary of the Society for Dance Research; to the Hague in 2006; and to ‘Black-Ey’d Susan’ at the restored Theatre Royal, Bury St Edmunds in 2007. 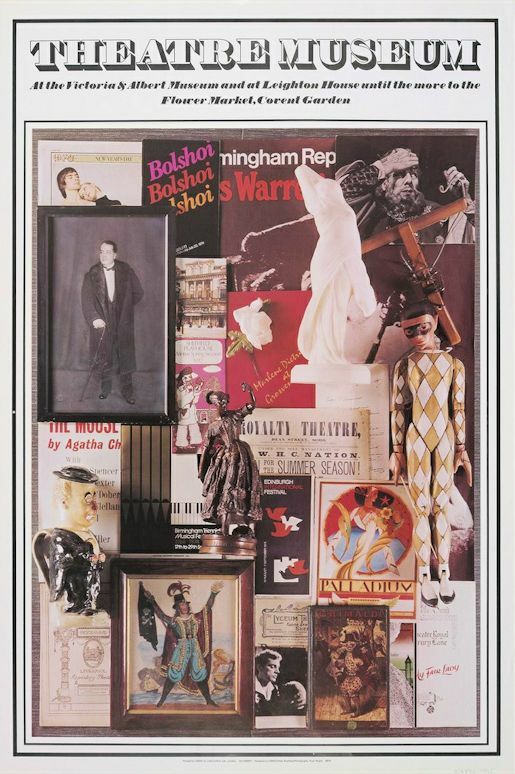 The Theatre Museum, after a fierce campaign against, was closed on 6 January 2007; the contents became ‘the Performing Arts Collections of the Victoria and Albert Museum’. 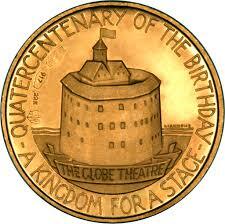 The TAC wound itself up in 2002, because its aims had been achieved or taken over by the Theatres Trust. The Poel Festival moved to the Globe Theatre in 2000 but the arrangement ended in 2004, when for one year it was held at the Theatre Royal Haymarket, and thereafter returned to the National Theatre as the Poel Event. The first training day, called ‘Speaking English Classic Drama’, was held on 31 October 2007 for twenty-five young actors and directors. The experiment of a London club for the Society was tried at the Agency Club from 2005, and then at the New Cavendish Club from 2007. The Society’s Diamond Jubilee was celebrated with a garden party at Garrick’s Temple and a conference at Richmond Yorkshire on ‘The Georgian Playhouse and its Continental Counterparts, 1750-1850’, together with publication (with the British Library) of a facsimile edition of Winston’s Theatric Tourist and Don Chapman’s book on the Oxford Playhouse. 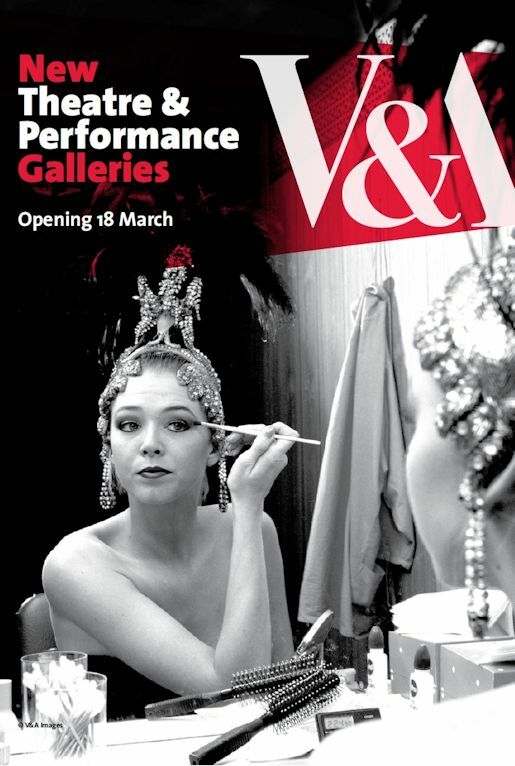 In 2009 four galleries were opened at the V&A as a permanent home for the theatre collections under the care of the Theatre and Performance Department. In 2017 most of the Society’s own archive was deposited at the V&A. 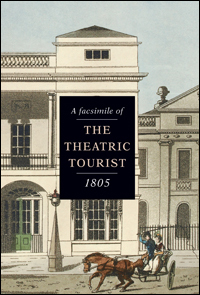 Outings during the decade included a visit to the Normansfield Theatre; to Orleans House for an exhibition entitled ‘Shakespeare as National Hero’ followed by an informal discussion between STR President Timothy West and member actor Oliver Ford Davies; to Kensal Green Cemetery with the Irving Society; to the site of Kean’s grave in Richmond followed by a performance at the Orange Tree; and a Trustees’ visit to the Royal Opera House workshops at Purfleet. 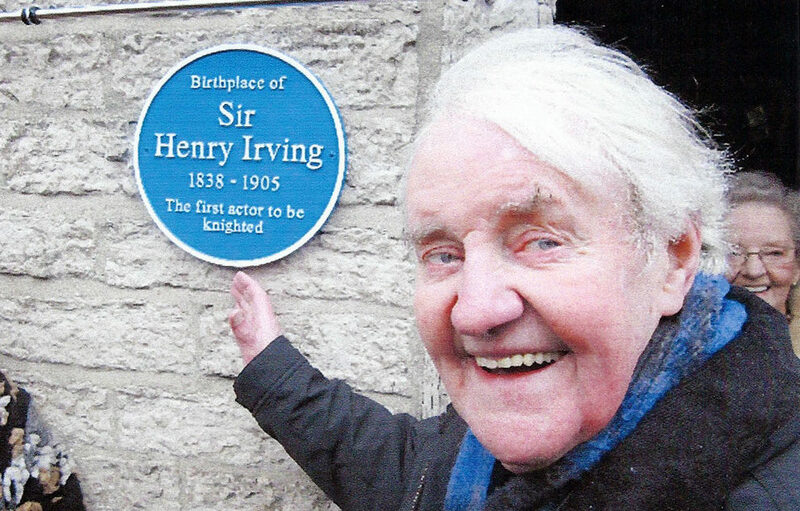 STR members joined the Irving Society for a dinner at the Garrick Club when Sir Donald Sinden was presented with Honorary Life Membership in honour of his up-coming 90th birthday. The Society was well represented, both in delegate numbers and practical support, at the John Rich Conference in January 2008. The 70th Anniversary of Theatre Notebook in 2015 was celebrated with a Garrick Club lunch at which a number of early editors were present, followed later in the year by a symposium ’70 Years of Theatre Research’. The Poel Event continued at the National throughout the decade. In 2016 it grew into two full days when the Royal Central School became a partner in the event now known as the Poel Workshops. During these years a New Scholars Prize was created and the New Researchers Network established. Further initiatives included a Theatre Study Day at the NT Archive; an Oral History conference at Rose Bruford College; a major conference on ‘Theatre in the Regency Era: Plays, Performance and Practice’ at Downing College Cambridge which included a visit to the Festival Theatre; a performance of Richard Brinsley Peake’s The Bridge that Carries us Safe Over to mark the 200th anniversary of the opening of Waterloo Bridge; and membership of Library when the New Cavendish Club closed. 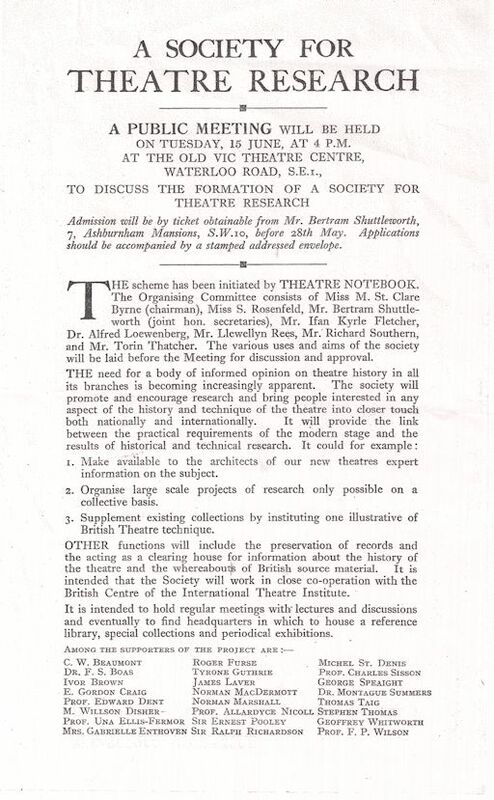 The decade closed with preparations for the Society’s 70th anniversary, which would include a special edition of Theatre Notebook entitled ‘Ma(r)king Time’, a joint research fellowship with TaPRA to look at the Society’s archive, and a major restructuring of the Website. 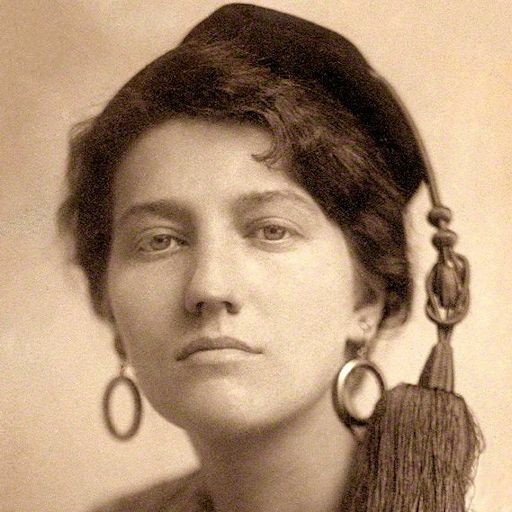 Gabrielle Enthoven deposits her collection of theatrical memorabilia with the V&A, the start of the museum’s theatre and performance archives. Celebrations of William Poel’s centenary, resulting in the establishment of the William Poel Memorial Prize, forerunner of the Poel Workshops. 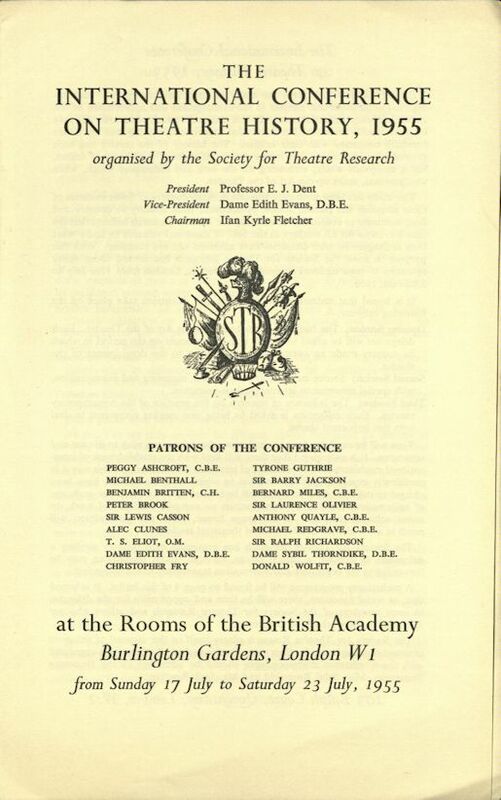 International Conference on Theatre Research, leading to the setting up of the International Federation and the first World Conference, held in Vienna in 1957. Public meeting on the setting up of a Theatre Museum, resulting in the forming of a British Theatre Museum Association. The STR joins with the recently established Council for the Protection of Theatres (one of the forerunners of the Theatres Trust) in countering threats to the St James’s Theatre (unsuccessful) and Her Majesty’s Theatre (more successful). The St James’s Theatre is finally demolished, amid protests. Professor Allardyce Nicoll is elected President. 10th anniversary supper for members at Crosby Hall. 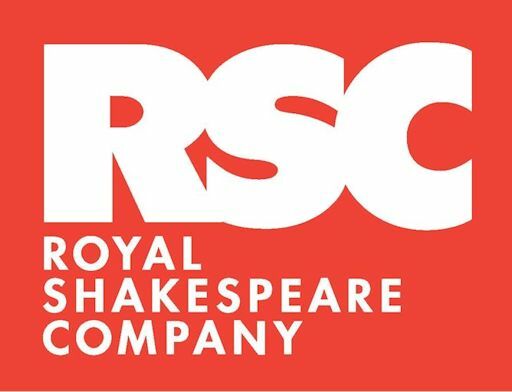 Royal Shakespeare Company is created by charter. 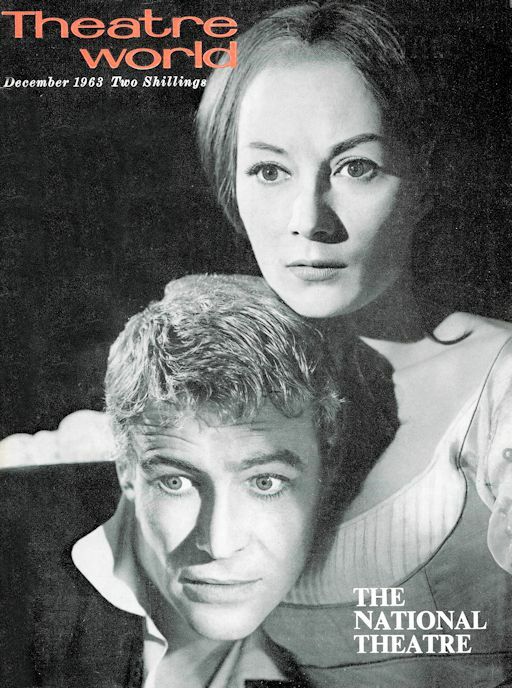 National Theatre Company is founded, based at the Old Vic, opening with Peter O’Toole as Hamlet. Conference on Civic Theatres to encourage the building and funding of community theatres by local authorities on the continental model. 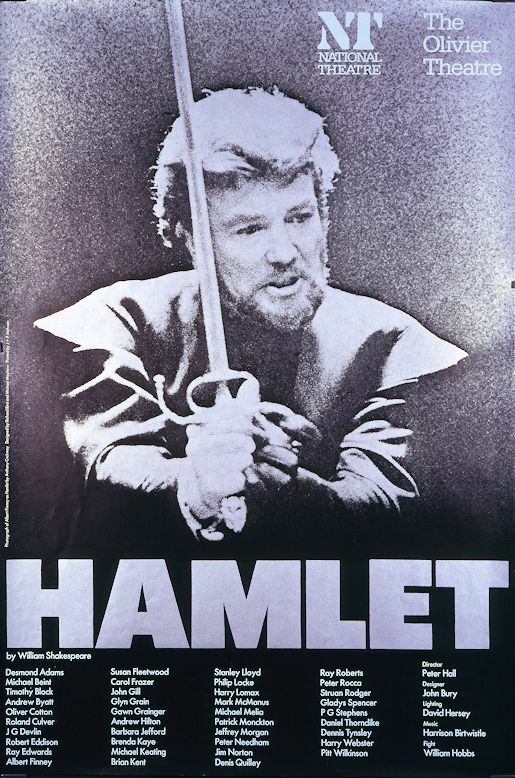 National Theatre on the South Bank opens with Albert Finney as Hamlet. 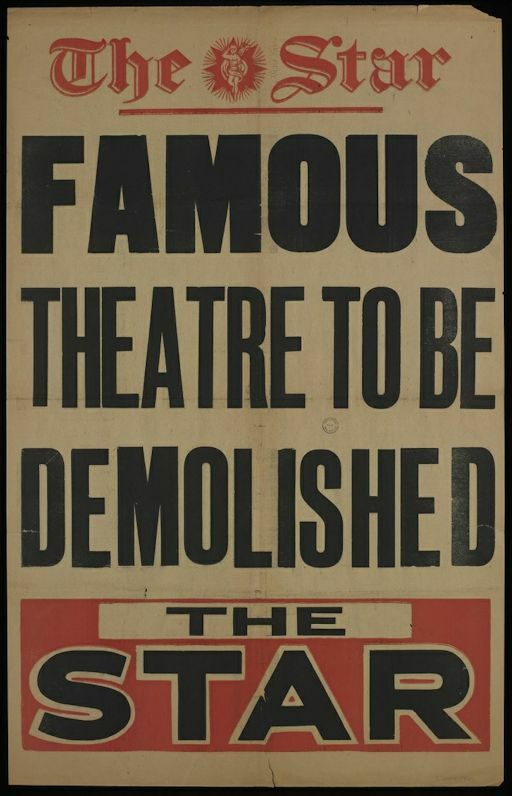 The Theatres Trust is founded by Act of Parliament to “promote the better protection of theatres for the benefit of the nation”. 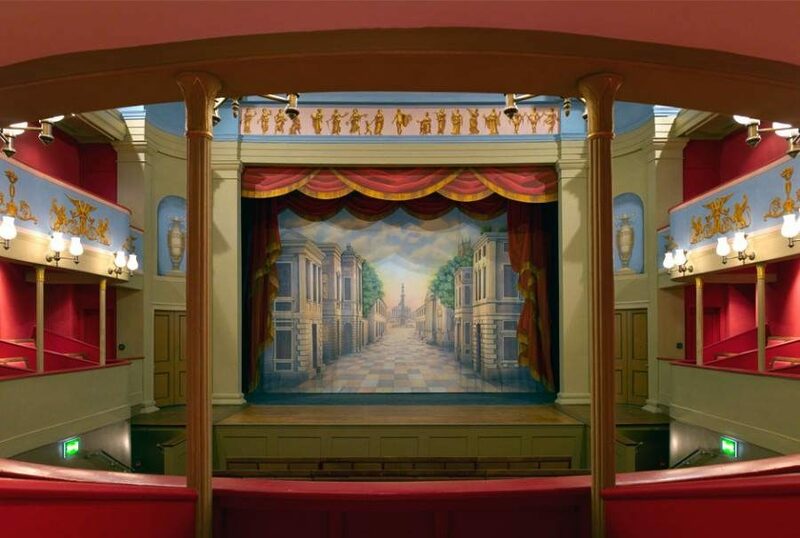 The Theatre Museum opens in Covent Garden. The STR’s Research Awards are established to mark the Society’s 40th anniversary. First STR Research Awards are made. The remains of the Rose Playhouse are unearthed on Bankside, Southwark. 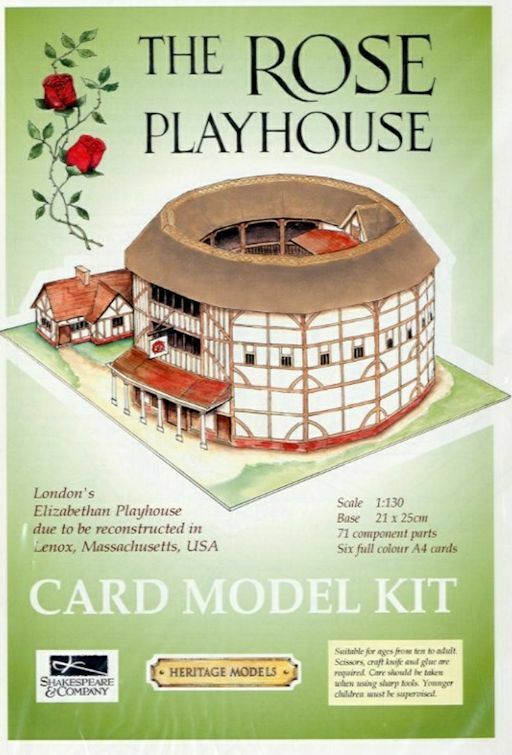 The inaugural season at Shakespeare’s Globe. There is discussion in STR of moving the Poel Festival there. 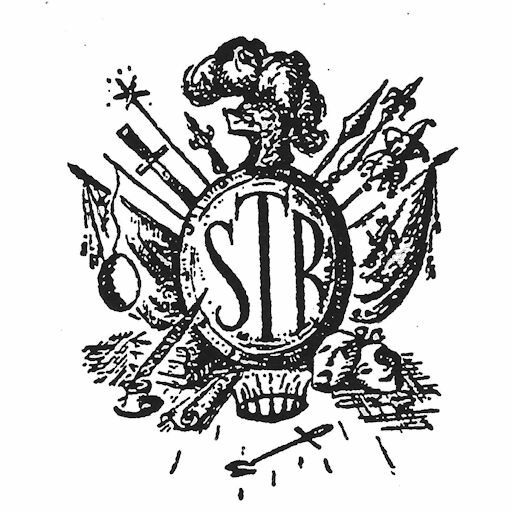 STR’s Golden Jubilee, marked by the founding of the annual Theatre Book Prize. The UK hosts the IFTR Conference, held in Canterbury and London. First Wickham Lecture is given at Bristol by Professor Dennis Kennedy. Theatres Advisory Council winds up. Theatre Museum in Covent Garden closes to be reborn as the Theatre & Performance Department at the V&A. Although the report and minutes of the meeting at which the Society was formed showed a general good will, it can be seen that there was also a strong tendency, in particular on the part of speakers from the floor, to visualise the Society as a lavishly funded, fully staffed centre where memorabilia would be perfectly conserved and answers to queries would be quickly provided. The story of the resulting Society for Theatre Research, however, is actually a story of what can be achieved on a low budget and with a small cast, none of them full-time.